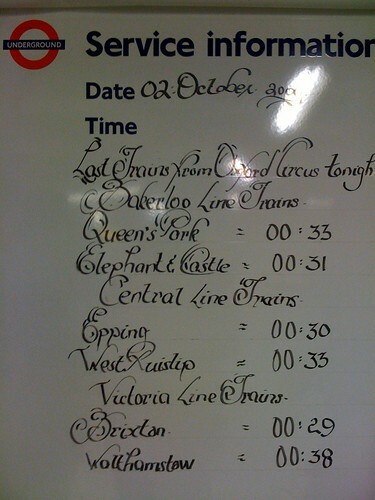 Are London Underground staff taking Calligraphy lessons? I also love the little hand drawn buses and river boats on the following sign, also taken by Yalli - Thanks for those. 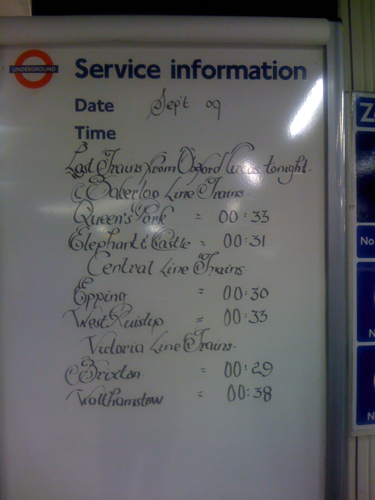 Perhaps Tube staff are having art lessons as well as calligraphy ones. By the way, if you take photos on the Tube, watch this space, as next week I'm getting together with the lovely people at Blurb to give you all another chance to win some of their books. What can NYC Subway learn from the Tube? The people that run New York's subway system want to enter into a two year consultancy contract with Transport for London. They feel that they've got a lot to learn from the London Underground - including our Oyster cards and arrival time indicators at station & bus stops. 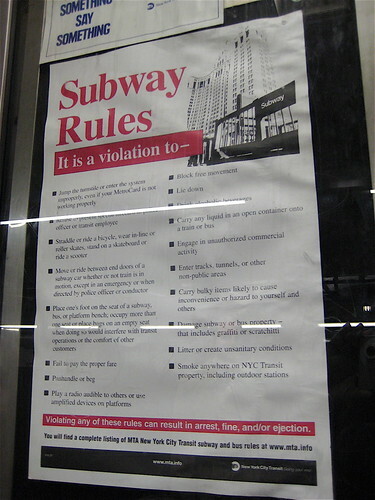 This would be a no-bid consultancy "Rather than having to bring in high-priced consultants, we’re getting experts with success already in doing these things, and getting them at public sector costs," said Jeremy Soffin, a spokesman for the Metropolitan Transportation Authority (MTA). Staff members from London would charge $125 to $200 an hour, according to a document released this week & reported in The New York Times (thanks to Emiana for the heads up for this). "It would save New York money; we deserve it to be lowered," said commuter Shakiba Hickman. "We want lower fares, but better service. 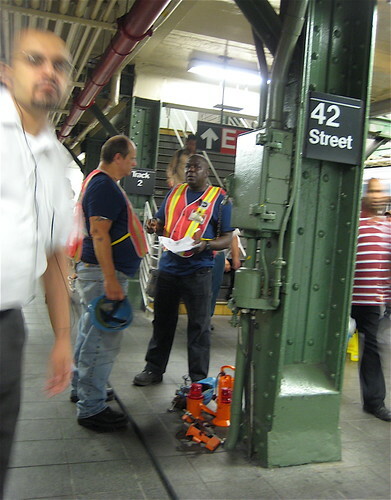 We have to be working around the MTA, not the MTA working around us." However others were sceptical about off peak travel and wondered if the discounts would really encourage more people to use mass transit on weekends. 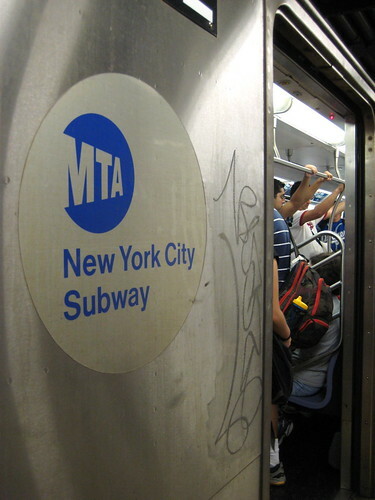 Susan G. Metzger, an MTA said, "I want to sit back and see what it really entails for us. Many people who use the subway don't really have an alternative. The only alternate would be a taxi, and our subway pricing is pretty good." I took the picture above on a Saturday morning and it's hard to imagine even more overcrowded trains if travel became even cheaper at the weekends. It will be interesting to see what comes out of this. I went to New York for the first time last year and it actually made me realise that we do have some things better in London. However, there's a lot that could be learnt from New York too and if the consultancy worked both ways, perhaps we'd find ourselves with slightly longer opening hours on the Tube (I know we'll never have the Tube running 24 hours). It was great to be able to travel late and actually see engineering & cleaning taking place while people were still travelling on the subway. Is there anything you think we can teach New York about subway travel? Perhaps not to call it subway but underground! And vice versa, what could they teach us? UPDATE - Just learnt that Bob Crow's not happy about this proposal. He said "If these people are as good as they are being cracked up to be then they should remain in London sorting out our problems." Worryingly he's implied that it's increased the threat to walk out over pay - see Evening Standard. Ian Morbin the London Underground station assistant who was filmed shouting at a passenger at Holborn Tube, & threatening to "sling him under a train" has resigned. He had been suspended with full pay while the incident was being investigated but has now chosen to leave for personal reasons. London Underground said "He has informed us he would like to apologise for the incident involving a passenger at Holborn Tube station on Thursday 15 October and hopes that his actions have not detracted from the professional job done by hundreds of London Underground staff every day. "As we made clear from the moment this incident was brought to our attention this kind of behaviour is totally unacceptable and does not represent the way our staff go about their jobs helping millions of customers every day." A number of people wondered if the unions would come to his support with industrial action if he was dismissed as a result. However, Morbin, was not a member of the RMT. Interestingly they were upset that the media & internet reaction to this had harmful consequences for a lot of frontline staff who are members of the RMT. They were worried of a "trial by Twitter". They said: "There is an established procedure through which passengers can complain about staff. Passengers have the right to have complaints considered, and staff accused of wrongdoing have the right to a fair investigation and hearing which takes into account the full circumstances and context of any alleged incident. 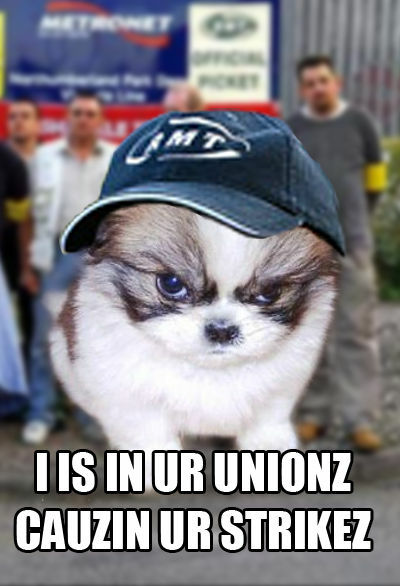 However, many of the comments posted on the internet have demanded the CSA's dismissal without any reference to his right to fair hearing; some have threatened violence towards him; others have made generalised attacks on Tube staff as a whole; a few have even attacked RMT, despite the CSA concerned not even being a member!" Luckily the customer assistant had realised his behaviour was unacceptable. Everyone's actions are under scrutiny though and although people (both staff & commuters) may think they're invisible when travelling on the Tube - they're not. Someone will be always be aware of what's going on and it means that we should all be responsible for our behaviour, no matter how riled we get by our commute or other commuters. Some interesting snippets of London Underground history concerning the murky world of intelligence and espionage. Mr X sent me this while he was developing what looks like a great London walk - The Intelligence Trail. 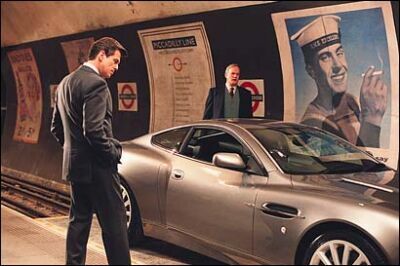 "For everyone who's seen the Bond movie Die Another Day, we see a supposed secret 'Vauxhall Cross' station. Truth however is very often stranger than fiction. Whilst Vauxhall Cross doesn't exist, there are rumours however that there WAS a secret station for MI6 to transport its staff to its Westminster Bridge Road headquarters (from the mid 60's until their move to Vauxhall Cross in the 90's). "The building - now apartments - is only a stone's throw from Lambeth North station. However one of the people involved in the redevelopment of the property noted it was a rather interesting project. The Bakerloo and Northern lines cross diagonally beneath the building, and when asked by the developers whether any other tunnels were below the building, London Underground were said to be 'noticeably evasive'!!! "MI5 officer (and would-be traitor) Michael Bettaney made several (unsuccessful) attempts to contact the KGB in central London in the early 80's. One of these involved asking his Soviet target to leave a drawing pin ('any colour'!) at the top of escalators 3 and 4 in Piccadilly Circus station if he wanted to arrange a meet. Luckily for us we had MI6 asset Oleg Gordievsky in the KGB's London station who told the Brits what was going on, pronto. "Also during the Cold War, there was a belief among Russian intelligence officers that our security services looked out for spies behind the large advertisements bedecking tube stations. "Finally, the tube stations Kew Gardens, Mornington Crescent, Pinner, Piccadilly Circus - have all played their part as rendezvous points for Soviet agents and their handlers in decades past." So next time you see someone in a raincoat with a packet of drawing pins lurking around the top of escalators, throw them a googly by saying "The Portuguese newt is crouching on the eastbound platform" and see what they do! If you've any other spy or espionage story about the Tube, leave it in code in the comments below. 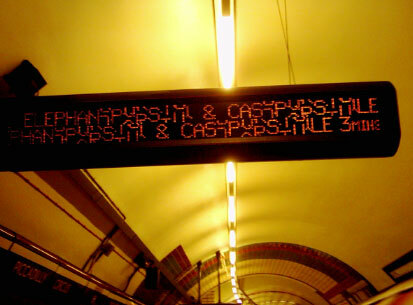 What started as a mis-reading of yesterday's post by Tom Phillips has led into a little London Undeground experiment. Tom mis-read my post on Twitter about interviewing Mr Warwick Avenue and that led to the question "Ah I thought you were interviewing someone really called Warwick Avenue". This led me to idly wonder on Twitter, whether anyone shared the same name as a Tube station. It pays to never idly wonder anything on Twitter as shortly afterwards people were Tweeting names of people (real & imagined) who had the same names as stations. First off the mark with a real name was Sahra T who found Warren Street. 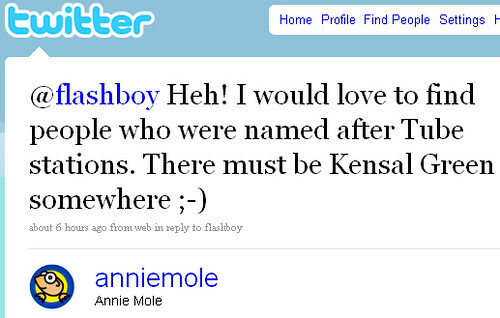 Not content with that she also found a guy called Brent Cross! By now a hashtag #peoplewhoaretubestations had been devised by Chris Applegate. Tom found several Richard Mansworth' s on Facebook - surely one of them must be called Rick. TheJT found a Ken Ton on LinkedIn and searching on Facebook led to many others. Terence Eden made the fair point that everyone seems to pronounce Harrow & Wealdstone as Harold Wilson. Having the same name as a station seems to necessitate that you do some sort of masculine job so you don't get picked on. Chris found a muscular looking designer & tattooist called Colin Dale. Whereas Michael Hanley found a ex-lion tamer called Stan More. We must be missing more! Did you go to school with a Leyton Stone? I'm pretty sure there must be some Deb Dens and Perry Vales around. Failing that - if there's any more puntastic imagined names you can come up with like Anthony Gladman's suggestion of Stephen Bury after he joined the army and became Gunner S Bury, they'd be most welcome. I think TfL should let them all have free travel for a year if they got them all to pose for pictures at the relevant stations! UPDATE - Thanks to the Telegraph for featuring this as a "craze"! Not sure I'd go that far, but it's fun seeing how many real Tube station people exist. Also I was featured talking about all this on BBC World Service last week at about 49 mins, 42 seconds into this show. There are some lovely London Underground staff around (thankfully Friday's incident is rare), like the bloke at Warwick Avenue Tube station who makes people's days with his temporary signs & general cheery manner. Melanie Seasons got talking to him and wondered if he knew how his pictures were posted on Flickr & blogs like mine. In the meantime, is there anything you'd like to ask him? Last week there was an incident where a man was dragged along a platform as his rucksack was stuck in a Tube train door, and now this week, blogger, Jonathan MacDonald has filmed a scene where an elderly man was treated rudely by Tube staff for also getting stuck in doors. Thanks to Whatleydude for alerting me to this. I'm sure that a Tube staff will jump to the defence of the two staff members, but it's at times like this, I really despair. This comes just after we get an announcement of fare rises and possible Tube strikes. Not only do passengers have to put up with expense & inefficiency but abuse as well. UPDATE - There's been a big reaction to the video on Twitter this morning - with "Holborn" (where it all happened) and "TfL" top trending. The Telegraph were the first media outlet to pick up on this - good for them! 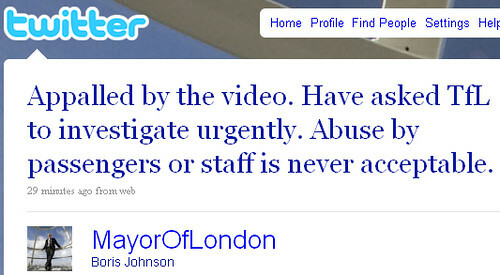 Now Boris Johnson has Tweeted that he finds the video appalling and will get TfL to investigate urgently. Hopefully there will be a full statement from TfL on this. UPDATE - TfL have made the following comment for now on the YouTube page "We are appalled by the scene captured in this video and will investigate thoroughly and urgently what﻿ took place and what led to it. We do not tolerate members of the public being abusive to our staff but neither will we tolerate members of our staff abusing members of the public." Boris Johnson today announced a raise in London's public transport fares for 2010, which he called "painful in the short term". Painful pure and simple would have been more accurate, as this will cost the average commuter an extra £100 per year. All London Underground fares will rise by 3.9 per cent. For Oyster pay-as-you-go users, a zone one Oyster tube fare will rise from £1.60 to £1.80. Most other Oyster pay as you go fares on the Tube will also increase by 20p, with larger increases in some longer distance peak fares. There's currently no way of working out what those larger fares will be. The Mayor's site says "TfL's planning assumption will be that fares will rise RPI+2% each year. However, the actual level of fares will be decided by the Mayor". Johnson has realised that these increases won't be welcomed and said "Nobody wants to make an announcement like this, especially when Londoners are feeling the effects of the recession. The crucial thing is that we safeguard the investment in our city's future and that's why I'm asking Londoners to accept this difficult decision. With this package we can protect the elderly, the young, the poorest, and disabled Londoners, and can go forward to deliver the vital improvements that Londoners deserve – including Crossrail, the upgrade of eight Tube lines, new trains, the cycling revolution, and a host of other improvements ahead of the 2012 Games." Unless you decide to walk or cycle to work, most Londoners won't have much choice but to "accept" the decision, so I'm unsure why we were asked. "This will be a slap in the face for the millions of Londoners who will be seeing no increase in their pay packets this year. It is all very well Boris trumpeting a zero increase in his share of Council Tax. Fare rises affect far more people, at far greater cost." * A seven-day bus pass rises 20 per cent from £13.80 to £16.60. * A zones one and two weekly travelcard is frozen at £25.80. * Cash fares frozen - on buses they stay at £2 and a zone one Tube journey remains at £4. * Most Oyster pay-as-you-go Tube fares will rise 20p per trip. * The daily cap on Oyster bus and Tube travel increases by 50p. * Plans to install step-free access at six Tube stations have been scrapped. Bus travellers will be hit the hardest. Overall, bus fares will rise by 12.7 per cent. So along with the Tube fares by 3.9 per cent, that's a big over inflation increases (CPI inflation is currently at 1.1 per cent). TfL expects the changes to result in a small fall in bus passenger numbers but says the Mayor's aim is to encourage more people to cycle or walk. Johnson made a large statement in the Evening Standard as to why he "has no choice" but to raise fares. Covering all the stops, in his defence, he's also added a video on YouTube (see above). It is a fares package that has been produced after long consultation, and Londoners should know that it is being accompanied by a sustained and determined assault on costs at Transport for London." It'll be interesting to know what this cost cutting at TfL is, but in the meantime get set for paying even more for your journey. We already live in one of the most expensive cities in the world for public transport and let's hope that with these fare hikes, there'll be no more spin about it being value for money. 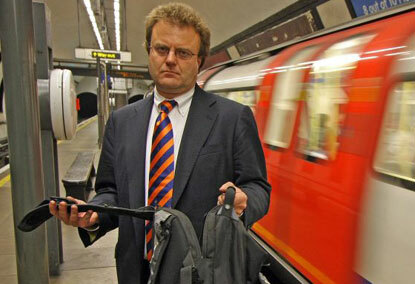 I've given up waiting for TfL to give mobile phone coverage over the deep level bit of the London Underground. But in the meantime I wondered if anyone knew of certain unexpected stations and lines where you could get coverage underground? My friend L J Rich discovered that in the 5th Carriage, Westbound Central Line at Mile End, she could make a phone call. I bet there must be other parts of the Tube like this, which it would be really handy to know about if you needed to make a lightning quick call or check emails, or send a text. (I know there will be a number of naysayers for an idea like this, but when, like me you travel half your journey overground on the Tube, you'd be surprised how few people actually use their mobiles with inane chatter, simply cos it's too noisy). There's certainly a bit underground on the District Line around Sloane Square where you can call. Perhaps it's possible to have a map of mobile phone hotspots. I bet there's probably some correlation between the depth of the station, the proximity to masts and your network provider. Anyone think it's worth doing or have any theories? Do you know any secret hot spots on the Tube where you can call underground? Just in case you thought there might be a Xmas with no threat of a London Underground strike, you'd be wrong. The RMT are going to ballot their members about a walk out in the run up to Christmas, as part of their lengthy pay dispute. The RMT union had already rejected as "miserly" a two-year deal of 1.5 per cent this year and RPI plus 0.5 per cent in the second year. Bob Crow, the union's general secretary said "We are looking for a pay offer that matches up to deals elsewhere in our industry and which reflects the real costs of living and working in an expensive city like London. "RMT remains available for further talks with a view to moving this issue on and reaching a negotiated settlement acceptable to our members." Richard Parry, acting managing director of London Underground, said: "Londoners will find another RMT strike threat hard to take, especially when we are offering a two-year above inflation pay offer. "Many Londoners have seen their pay frozen or have lost their jobs this year. In contrast, we are offering stability and security in one of the toughest economic climates in decades." He added: "Another strike will achieve nothing except lose staff more pay and cause unnecessary frustration and disruption to Londoners." So add a Tube strike to the ongoing postal strike and it looks like an un-merry Xmas for Londoners. 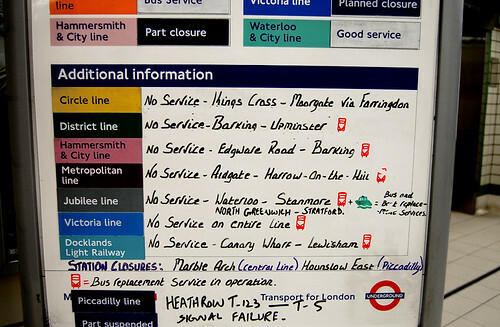 Update: 18th December 2009 - 100 power staff who work on the Tube will be going on strike over pay. 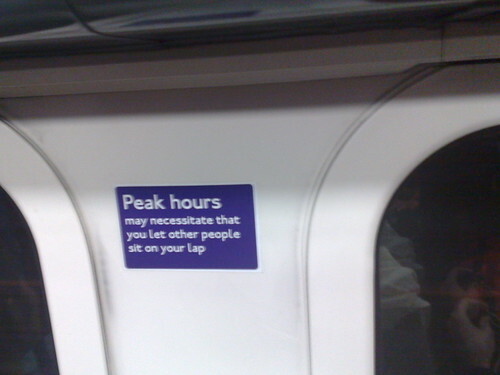 You've probably seen this sign on the Tube. 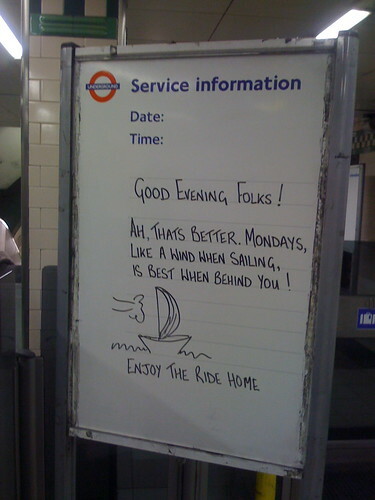 Specially if you've been at Embankment station. 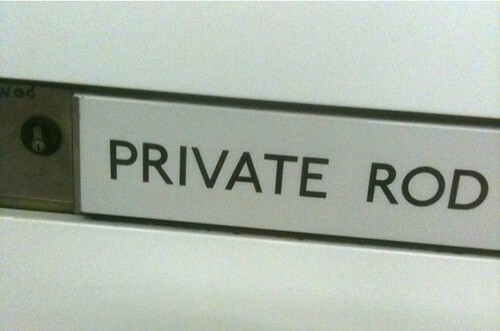 Paul Clarke asked me to explain who or probably what Private Rod is. 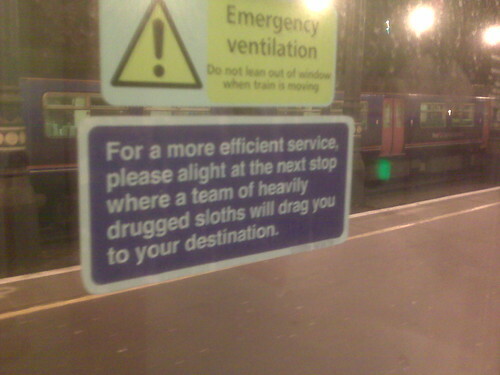 It's the sign on a door at the London Underground platform there. Does anyone know? What I didn't know, is that he also has his own Facebook page (thanks Quartistice) and no one seems to be any the wiser there. Someone please put us out of our misery and explain. A cautionary tale really showing how you should be careful about getting things stuck in London Underground doors. Lee Roberts was trying to get onto some crowded Northern Line trains. He said "When the fourth train arrived and the doors opened I squeezed on board and put my rucksack by my feet but I got pushed back again on to the platform. As I pulled my rucksack up to my shoulder the strap became caught in the door and as the train moved off I found myself being pulled along a few feet. "It was terrifying, I thought I was going to get killed as there was only about 100 feet between me and the wall before the tunnel. The worst thing was that feeling that the train couldn't stop and the driver didn't know I was there.". Fortunately the strap broke before something more serious could have happened. However, no station staff came to his help when he was trying to get assistance to retrieve the contents of his bag from the tracks. Also as Londonist point out the comments by some Evening Standard readers, seem to place the blame on Roberts - saying he bought things on himself. DeanN from Londonist wrote "While compassion isn't London's strong suit, blaming the victim is a little extreme, and clouds the bigger issue - that neither the driver nor station staff seemed aware of what was happening." This situation could have ended in a tragedy (if he'd had a stronger rucksack that didn't break) and it's worrying to think that people can be dragged along the platform like this. Hopefully, Transport for London will be able to think of a better statement than not wanting to disrupt Northern Line passengers in the rush hour to collect the guy's belongings. I'd be interested to hear from any staff as to how the train was even able to go along any distance with the door partially open and a man hanging from it! I wonder how many times someone has really gone round & round asleep on the Circle Line? I saw the ad below yesterday. 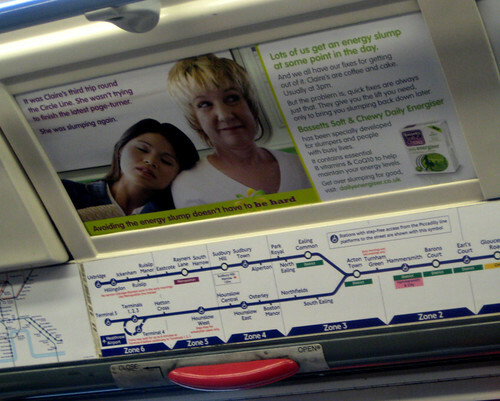 It features a tired sleeper, falling on a surprisingly cheerful looking fellow commuter. I know that I never look happy on the odd occasion I've been the pillow of a London Underground sleeper. My worst Tube sleeping episode was when I fell asleep on the Piccadilly line and ended up at one of the Heathrow Terminals. I then fell asleep on the way back, missed my stop by about four stops. Went back on the line and it was all I could do to keep myself awake to change lines at Turnham Green. I had visions of being on that Heathrow loop for the whole evening. Thanks to Matt Moore from The Telegraph who featured a couple of pictures from my blog for a article on Guerilla Rail & Road Signs. They're spoof signs from around the world which fight back against ones we face each day telling us what or what not to do. Thanks again to Fimb & Peter F who sent both of those into me. Although this one taken by James Whatley wasn't featured in the article, I think would have been a contender. To me, great spoof signs, are ones that you hardly notice, but when you do, you start looking around the carriage wondering if other people have seen them too. You then start getting hopeful that some tourists might also see them & ask fellow passengers or staff what the deal is with them. You kind of hope they will appear in blogs around the world or in letters back to friends & families. "You know in London the subway is so crowded people have sit on each other's laps. It's true I saw it. There was a sign and everything". 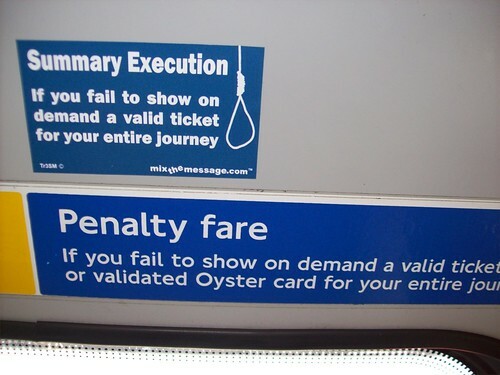 If you see any other spoof signs on your Tube or rail journey please let me know. In the meantime enjoy the signs in the Telegraph.